Barj S. Dhahan hails from a Sikh family from rural Punjab. He came to Canada in 1967 and has since lived in Vancouver, British Columbia. He is a graduate from the University of British Columbia and Regent College. Barj is the founder and chief executive officer of Sandhurst Group of companies, specializing in commercial real estate development. Sandhurst Group is also the largest Esso dealer and one of the largest Tim Horton’s franchisees in British Columbia. Barj has been instrumental in launching numerous education, health, and community development projects in British Columbia and in India since the 1980s. 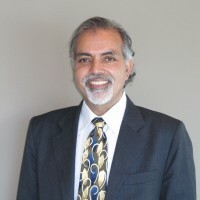 He is the co-Founder and Director of Canada-India Education Society (CIES), a registered Canadian charity focusing on health promotion and education in Punjab, India in partnership with Guru Nanak Mission Medical and Educational Trust (GN Trust), established by his father Budh Singh Dhahan. Starting from the opening of a 40-bed hospital at Dhahan-Kaleran in 1984 followed by a primary school a few years later, GN Trust now operates a public school covering all grades, with 1,600 students coming from 130 surrounding villages and towns, and a 200-bed hospital. Its nursing education program offers both a General Nurse-Midwifery (GNM) diploma (with 649 graduates) and a Bachelor of Science degree in Nursing (389 graduates). Barj convinced the University of British Columbia’s School of Nursing to partner with CIES and Guru Nanak College of Nursing at Dhahan-Kaleran, benefiting primary health care practice, research and education, while providing Canadian nursing students with valuable learning experience. He completed an important health promotion initiative in 2005, covering 60 villages in Punjab, with nearly $ 500,000 funding from CIES, Canadian International Development Agency (CIDA) and others. CIES also invested over $200,000 to build clean water and sanitary sewer system in Daulatpur, Punjab. Barj has also provided micro-enterprise training in rural Orissa and Bihar, India and developed linkages between Indian NGO’s and similar Canadian organizations. He has also raised funds for youth camps in BC and services for self-employment training and support programs. Barj is a certified Yoga teacher and a motivational speaker and facilitator with groups and individuals. Sandhurst Group has awarded over $ 50,000 in bursaries to talented and needy high school graduates in British Columbia and donated over $ 100,000 to Tim Horton’s Children’s Foundation. Recently Barj and his wife Rita have made a significant contribution to establish the Canada-India Centre for Excellence in Science, Technology, Trade and Policy at Carleton University, Ottawa.